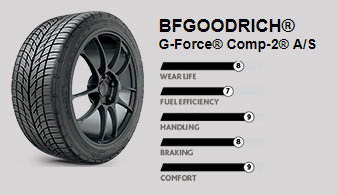 BFGoodrich®’s performance prowess doesn’t stop where the pavement starts. BFGoodrich® street tires have racked up impressive accomplishments over the years — from creating the first street tire to capture the pole position at the 24 Hours of Le Mans to creating an entirely new level of street tires, the extreme performance category. So it’s no wonder why top driving schools like Ford Mustang Racing School and Skip Barber High Performance Driving School, use BFGoodrich® tires exclusively. 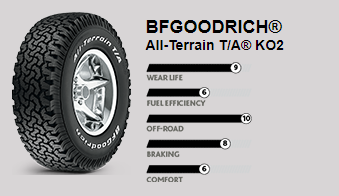 Shop BFGoodrich® tires with McMahon’s Best-One Tire & Auto Care for driving in Fort Wayne, IN, New Haven, IN, Leo, IN, and areas near and far. Based on internal dry handling and internal wet and dry autocross test results using a 1995 BMW M3 lightweight and a 2011 BMW 328i vs. General® G-Max AS-03 and Yokohama® AVID ENVigor tires in size 225/45 ZR17.